Families Love The Nostalgia that the Distraction Charter Boat offers! We would like to introduce you to the charter boat Distraction. 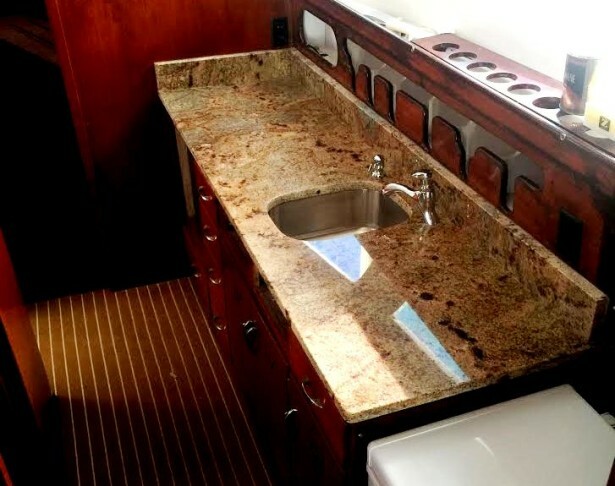 She is a 62 model – 41′ Hatteras and is in immaculate shape for her age. She was completely retro-fitted and updated in 2002 and again in 2017. She is made out of fiberglass and she is well maintained, odor free and very safe. We keep her at the Orange Beach Marina and we spare no expense when it comes to routine maintenance or safety. 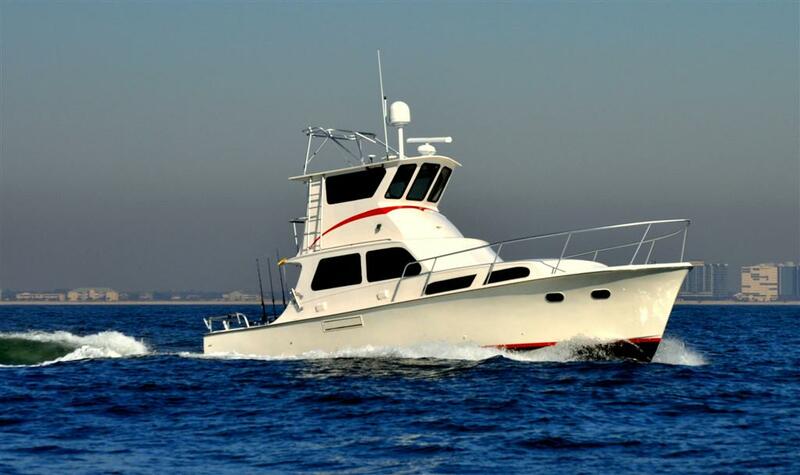 Choosing a charter boat that is well maintained, fully operational and safe is the most important goal of any parent who is contemplating taking their family deep sea fishing. We go the extra mile each year to make sure our charter boat is ready to go, so we won’t have any down time or equipment failures before, during or after your trip. Even though we spend close to $35,000 a year on maintenance, we still have a few unforeseen battery failures and an occasional electrical and sometimes a minor mechanical issues. The good thing is, we have two engines and back up systems on board to ensure we have an uneventful fishing trip. Every year, we spend $30 to $40 k just on maintenance and boat upkeep. In January 2019, we replaced the interior carpet and had new seat cushions made to sit on, to ensure you have a clean and odor free sitting area. Our latest big project was completed in spring of 2017 when we decided to pull her out of the water and give her engines a new life (again). We took everything electrical and mechanical out of her so we could start fresh. We sent her two Caterpillar 3126ta-350 hp engines off to the factory to be re-manufactured. There was nothing wrong with them and they were running great, but they did have 14 years and 14,000 hours on them. Coming from the aviation and trucking industry, I know the importance of timed or scheduled long term maintenance. 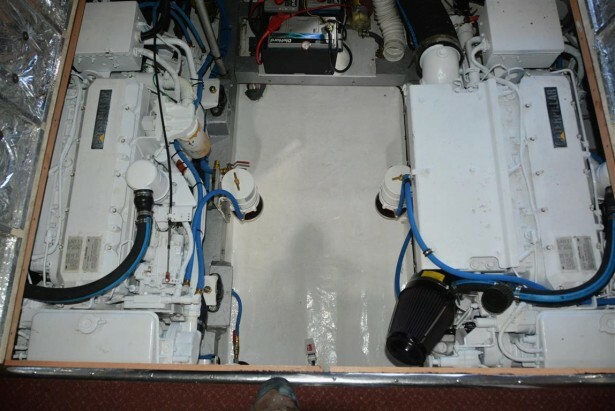 After a couple of months in dry dock, we got the engines back and put them in service March 2, 2016 and they are performing flawlessly, just as expected when you do things the right way. 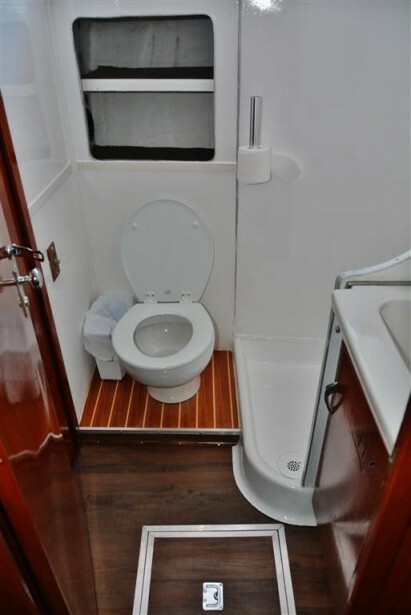 We also renovated our restroom, purchased a new fresh water Marine toilet, added new windows, painted, rewired and even added new plumbing fixtures . After 3 1/2 months of hard work and $91,000 in improvements, she is now ready for your family’s enjoyment and hopefully another 14 years or more of excellent service. 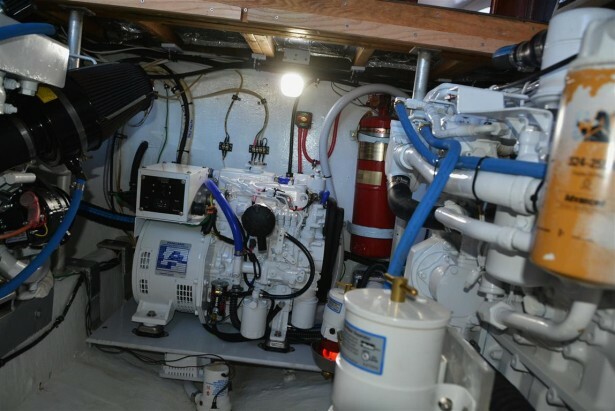 In April 2019, we purchased a new 9kw Northern Lights marine generator for $14,000. While we were installing the generator, we had or mechanic run our engine valves and set our fuel injectors so they are running efficiently. She has classic lines and has a personality of her own. Her hull is bulletproof and her finish is nice. She’s a charter boat, not a yacht. you can relax on this boat and you won’t hurt a thing. This is one smooth riding, reliable and safe fishing machine. 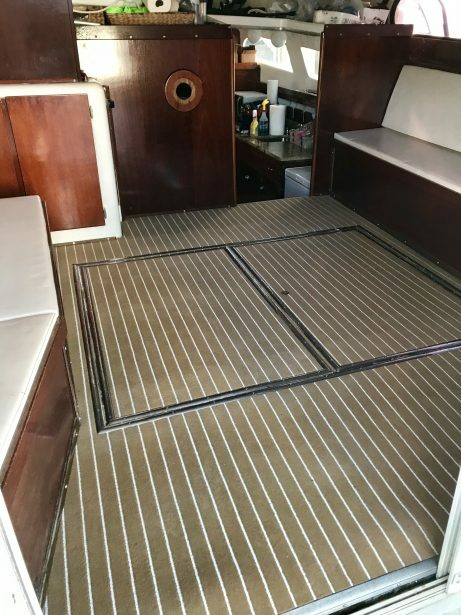 Our newly installed teak carpet makes the interior a little more nautical looking. 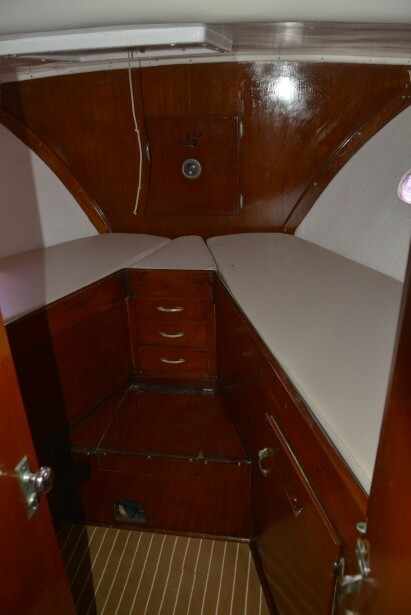 The inside of our charter boat offers all the comfort of home with a climate controlled cabin. She has a clean odor-free, private restroom for those who expect the best. She has a kitchen and a microwave on board. Our refrigerator is compact so we encourage you to always bring your own cooler full of your favorite beverages and food. If you don’t have a cooler, that’s not a problem. We always have a big cooler on the back deck. This is our kitchen. We have a new granite counter top in 2017. This is the forward cabin or v-berth. Our restroom is clean and odor free. Our toilet (head) is a full size model and is fresh water filled. You may also flush our paper with this marine elegance head. Our Caterpillar 3126 marine engines were re-manufactured in 2017 to new condition and are 350 horsepower each. Our new 2019 Northern Lights 9 kw generator makes electricity for the boat, which runs the air conditioner and electrical outlets. This is a $14,000 investment in our boat made on April 2019. Everyone loves our comfortable sitting and fishing area on the rear deck. There is plenty of room to fish, relax and enjoy some breathtaking sights. The outside sitting area is large and comfortable. We designed it for families that want to be comfortable while riding and fishing. 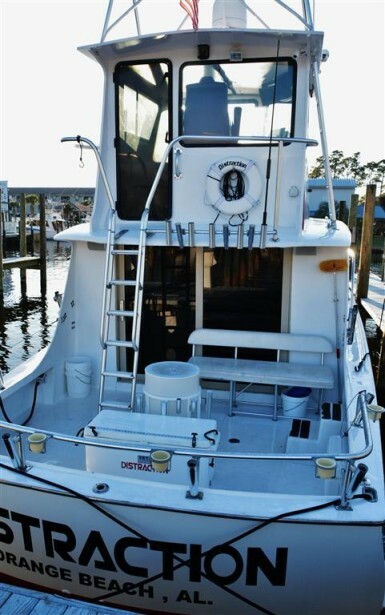 We have two comfortable seats, drink holders and rod holders so you don’t have to worry where to sit your pole when we move to the next fishing reef.